Radiation is a naturally occurring form of energy. Everyone is exposed to small amounts of radiation, but exposure to very high doses may cause serious illness and death. What Is Radiation and Where Is It Found? Radiation is a form of invisible energy given off by atoms, which are the tiny particles that make up chemical elements. Nonionizing radiation does not change the structure of an atom. Instead, it excites molecules and shakes them up. Natural sunlight, sun lamps, microwave ovens, radios, and televisions are sources of nonionizing radiation. Ionizing radiation is the more energetic form of radiation, and it can change the structure of an atom. Exposure to ionizing radiation can cause illness, because it can damage the molecules within the cells of the body, prevent the cells from functioning properly, and destroy those cells. Naturally occurring ionizing radiation comes from distant parts of the universe and from the sun. Radon, which is a colorless, odorless, radioactive gas, provides most of the background radiation on earth. Medical x-rays are a source of man-made ionizing radiation. Other sources of radiation are radioactive elements, which are used in medical research, nuclear power plants, and nuclear bombs. Much of what scientists know about the effects of exposure to high levels of radiation is based on studies of survivors of Hiroshima, Nagasaki, and Chernobyl. In August of 1945, during World War II, American pilots dropped atomic bombs over the Japanese cities of Hiroshima and Nagasaki. The heat, which reached thousands of degrees, and the radiation released by these bombs damaged and destroyed life over millions of square miles. At Hiroshima, more than 70,000 people were killed, and over 70,000 more were injured. Many more people died of radiation poisoning in the years following the explosion of these bombs. On April 26, 1986, in the Ukraine in Eastern Europe, the Chernobyl nuclear power plant experienced a meltdown. Because of a malfunction, the radioactive core was exposed, releasing radiation into the atmosphere. Although most of the radiation fell on Chernobyl, radioactive particles were carried by the wind all over the world. At least 29 people in Chernobyl died from radiation exposure, and several hundred others were hospitalized. Today, cancer, birth defects, thyroid disorders, and skin diseases are still affecting people exposed to the radiation from the Chernobyl accident. How Does Radiation Affect the Human Body? Radiation is a carcinogen (kar-SIN-o-jen), which means it is a cancer-causing agent. Because radiation occurs naturally from sources such as our bodies, space, rocks, soil, and radon gas, some exposure is unavoidable. The dose that the average American is exposed to during a year is considered safe, and both small and large doses of certain types of radiation are used in health care. For example, x-rays and CT scans (computerized axial tomography) are used to diagnose illnesses, and radiotherapy (high doses of radiation targeted at tumors) is used to kill cancer cells. damage to blood vessels and the brain, infection, and bleeding from whole-body exposure to very high doses of radiation, which usually leads to death. An ambulance worker wears protective gear against radiation exposure. 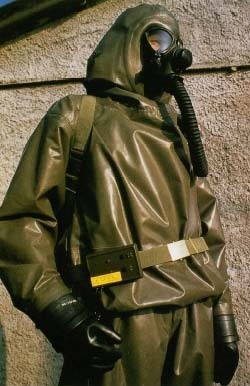 In the event of a nuclear power station accident or in wartime, the suit would provide protection against radioactive fallout, and the mask and backpack would provide for air filtration. Javier Pierini/Science Photo Library/Photo Researchers, Inc. The severity of the radiation-induced condition depends on the source of the radiation, the dose, the rate of absorption into the body, and the sensitivity of the particular tissue. A large dose of radiation can lead to cell death over hours, days, or weeks. Low exposure over time causes less dramatic effects because some of the cellular damage may be repaired. Scientists have learned, however, that higher doses increase the chance of getting cancer (but do not affect the type or severity of cancer), and that most cancers do not appear for 10 to 40 years after the person was exposed. Grant, R. G. Hiroshima and Nagasaki (New Perspectives). Austin, TX: Raintree/Steck-Vaughn, 1998. Yamazaki, James N. Children of the Atomic Bomb: An American Physician's Memoir of Nagasaki, Hiroshima, and the Marshall Islands. Durham, NC: Duke University Press, 1995. National Research Council. Health Effects of Exposure to Radon: Time for Reassessment? Washington, DC: National Academy Press, 1994. The U.S. National Institutes of Health (NIH) posts many fact sheets about radiation safety at its website. The World Health Organization has links at its website to many different organizations that focus on radiation safety, worldwide radioactivity monitoring, and protection of the human environment.